So, you’ve chosen the perfect location and dress. Now, it is time to choose a hairstyle. Are you going to wear it up or down? The style you choose is dependant upon the location of the wedding. Hairstyles for beach weddings is the most fun. Anything goes. You can wear your hair down in beach wave curls. Nothing looks more glamorous in photos than long hair blowing in the ocean breeze. If you want your hair down, but with a little structure, try a side swept style. Add a hair accessory to dress it up a bit. This can be a mixture of flowers, jewels, ribbon, and tulle. You can show a lot of your flare and personality with this piece. Remember, the beach has a constant breeze which could make wearing your hair down a little tougher than usual. If you don't want to worry about your hair getting messed up by the ocean breeze, go for an updo. 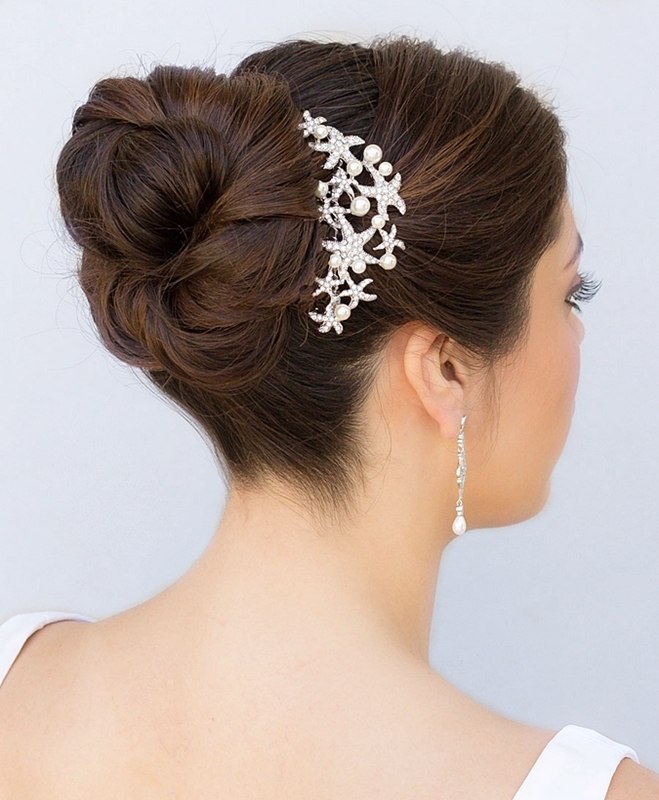 There are so many options for updos. You can choose a low bun or top knot. You can go with a messy (structured mess) bun. Don't be afraid to add an accessory too. You can even add a pop of color. If you are having your wedding in the hot desert or humid tropics, it's important to choose a style that will keep your comfortable. The last thing you want is to style your hair down, just to end up pulling it up because of the heat. The stress and excitement of the wedding alone will make you sweat, so consider the added heat and humidity of your location. With both of those climates, an updo is your best bet. You will be more comfortable with your hair off of your shoulders and neck. These cooler climates allow you more freedom than the hotter climates. You can choose an updo or to wear your hair completely down. This location is the best option of all of the locations for wearing your hair down, because you won't have to worry about an constant breeze messing it up or making you even hotter. Also, wearing your hair down can keep you warmer than updo. These climates are still perfect for wearing your hair up also. When you are planning your hairstyle, remember, location is key. You want a style that will stay beautiful the entire time and will also keep your comfortable.